Adiantum Ferns are commonly known as Maidenhair ferns, these popular, ornamental, deciduous or evergreen ferns are wonderful as indoor plants and Adiantum Ferns are also great for use in the garden. 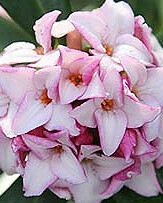 The common varieties are readily available for sale at nurseries and garden centres, others can be purchased online. There are over 200 species and a large number of cultivars with Adiantum pedatum, Adiantum fragrans and Adiantum venustum (Himlayan Maidenhair Fern) amongst the most popular species for growing in the UK. 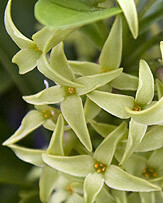 The arching mid-green foliage ranges from scalloped to fine and feathery (see picture below right). Some Adiantum are small and compact while others can grow to a metre in height. These ferns all have brown/black stems. The fern spreads from rhizomes and can also be grown from spores sown on humus rich, moist soil. 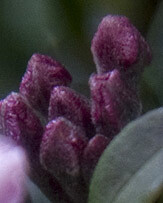 Its growth habit is clumping. Adiantum require well-drained soil, but must not be allowed to dry out. 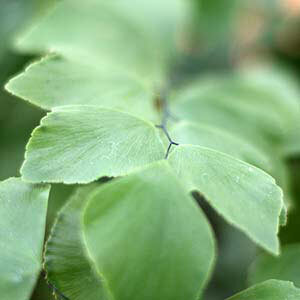 Maidenhair ferns can be planted in the garden in a sheltered and shady position with filtered early morning sun. They enjoy moist soils in shaded areas of the garden. 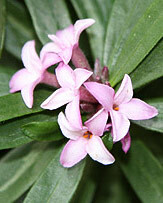 They can be used as a ground cover, edging plant, in the shade of walls and around pools or water features. 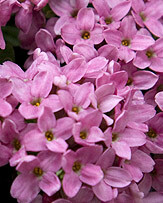 They are also very attractive as an under planting for roses and other shrubs. They do not tolerate heavy frost. Fertilize your Maidenhair ferns regularly with a diluted liquid fertilizer. Aphids and mealy bugs can be a pest but are easily controlled. Dead fronds should be removed in early spring. Do not disturb an established plant until dividing which can be done every 3-5 years. When using Adiantum as an indoor plant, position is important. They can be grown in pots and even in terrariums. They enjoy a well-lit position away from draughts. They require a stable temperature. Keep them evenly moist and provide some humidity by placing the pot on gravel or pebbles in a saucer with a little water. Maidenhair ferns can also be used in hanging baskets and pots in a protected area of the patio and of course will thrive in a fernery. Some species are hardier t han others so consider the conditions in your garden before planting. The Adiantum venestum is native to the Himalayas and is more tolerant of cold and frosty conditions than many other types of Maidenhair. Adiantum capillus-veneris will defoliate in very cold temperatures but then regrow in spring. Another Adiantum popular with gardeners is A. pedatum, a maidenhair with lovely tiered fronds that can grow to 40 cm in length. Like all Adiantum, plant in fertile, moist soil in a shaded position. 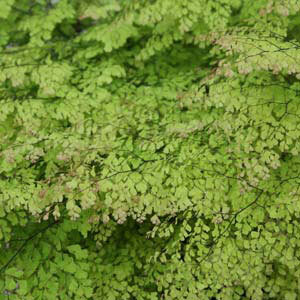 With a large range of Adiantum species available for sale online from nurseries in the UK. These attractive ferns are used widely in landscaping as well as in pots for indoor plants. Adiantum species vary greatly in foliage and size, Species include: A. aleuticum, Ad. pedatum. Adiantum or Maidenhair Fern plants are a popular shade loving plant for the UK. In the UK many Adiantum species such as Adiantum pedatum are a tough plant well suited to woodland garden. Adiantum fragrans is more widely used as an indoor plant, A. venustum works well as groundcover in a cool moist part shaded position, as does Ad.aleuticum. Pictured right is Adiantum peruvianum or 'silver dollar fern', more of a tropical species, not widely found in the UK.